On 1 October 2010, WHO experts and representatives of the Public Advice International Foundation (PA International) met to discuss vitamin-D deficiency in the WHO European Region. Discussions covered the mission and strategy of PA International and WHO/Europe’s work on nutrition, physical activity and obesity, including policy tools such as the European Charter on Counteracting Obesity and the WHO European Action Plan for Food and Nutrition Policy 2007–2012. 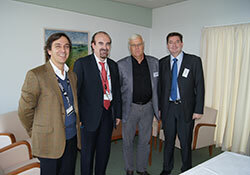 coordinate with WHO headquarters on the continuing development of micronutrient guidelines. PA International will outline a fundraising initiative to support these activities, in coordination with WHO/Europe and with the participation of stakeholders. The meeting followed a recent workshop, organized by the Standing Committee of European Doctors (CPME) and Public Advice International, on the widespread vitamin-D deficiency in Europe. People need vitamin D to maintain normal blood levels of calcium and phosphate, which are in turn needed for the normal mineralization of bone, muscle contraction, nerve conduction and general functioning in all cells of the body. Those at risk of vitamin-D deficiency include infants, adolescents and elderly people.